If you were given 800,000 won and a year to spend it, what would you do? This is a story about four crazy men using their options in unique ways. 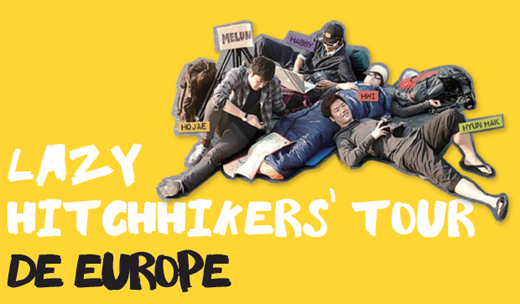 In the film, Lazy Hitchhiker’s Tour De Europe, these men travel throughout Europe with 800,000 won for a year. It might be an unrealistic or reckless story, but it is still a true story about four hitchhikers making the impossible possible. They are people who call themselves “SURPLUS,” meaning good-fornothings. Here is a one-year-record of these young men full of passion. This is an independent film, also called “indie film,” produced with the filmmaker’s original intention and independent of commercial capital. 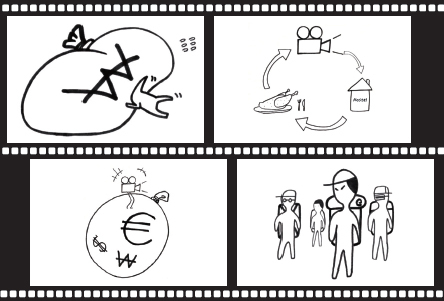 Commercial films make publicly adopted stories as a necessity to materialize excess profits in respect to marketing. Independent films, on the other hand, have their own peculiarities, making alternative forms and delivering special messages to express the filmmaker’s consciousness of what he or she wants to tell. This film was independently produced their way and includes their personal story. Four ordinary university students, having failed to make money to pay their tuition fees, one day came up with some great new ideas. They decided to deviate from the previously accepted norms of university students having to agonize about their future lives. They needed some new ways to follow their dreams. It was the idea of “bartering” that led their thoughts to a journey across Europe. Their goal was to cross Europe while bartering their self-produced video clips promoting hostels or restaurants in Europe in order to secure free rooms and boards. If the promotion videos successfully bring profits and popularity to them in Europe, then they would move to England to shot a music video for future superstars (like the next Beatles). Finally, they wanted to make a documentary of the whole process. With nothing more than foolhardy confidence, they first arrived in France. Their challenge initially seemed to go as scheduled - going from Paris in France to Nice in Italy. There were, of course, some troubles they encountered during this journey arising from hitchhiking with almost nothing. Thankfully, however, there were unconditional helpers who allowed them to successfully arrive in Nice. 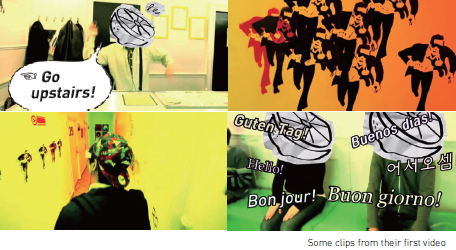 Problems arose now and then, because no hostel or restaurant needed their promotion video. Their finances - they started this project with only 800,000 won - got worse and worse, and they subsisted by camping out on desolate hills and eating small amounts of food. Along the way, a promotion video taken on by chance went viral. Three months after they arrived, they earned popularity throughout Europe and got the attention of the press, creating a sensation. They left for England to accomplish their next goal of making a music video for a future superstar, and they began shooting the music video of a British singer, Brian. There were some subtle conflicts between them, because Ho-jae wanted to work with both Brian and Arco. Arco is a British modern rock band of which Ho-jae became a fan in his early days. After leaving for England, there was no demand for their video, and the challenge became survival itself. They managed to finish the video along with their chores and extra work, but it was hard to complete their work with Arco because of the poor conditions and circumstances they faced. They informed Arco of all of these facts, and received an e-mail from them. What they want to say through this film is not “Challenge! Go ahead!” They would just like to show their own way of following their dreams and the process of overcoming hardships instead of forcing young men to face tough challenges. “If we don’t give up, there will be a miracle.” They dreamt, and their undreamed-of story became a reality. All trace of reality they had faced was eventually a miracle, or if not, they could obviously still turn those into a miracle. The enlightenment they found through this journey was both somewhat strange and special. The four youths offer words of consolation to youth getting tired of their lives and give them a new way of pursuing one’s dreams. Like riding a roller coaster, this was the four youths’ goofy yet serious and tough challenge. Would you have joined their special journey?